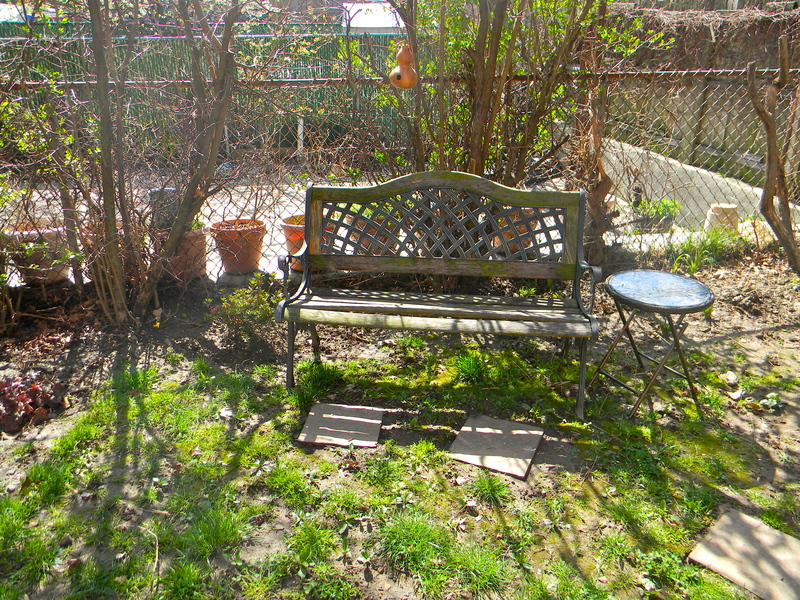 Then we got a few wrought pieces, including an iron table and chair set, from the old iron re-sale shop in Gowanus. I’ll probably play around with where to put it and what to grow underneath it. I’m thinking either some sweet peas or a clematis or two. 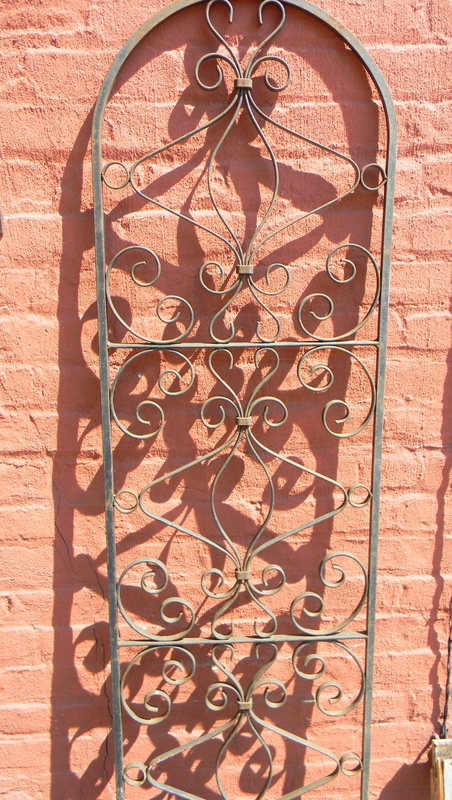 I’d love to attempt a climbing rose, but I’m not sure this trellis would provide proper support for them. If the trellis stays here, against the house, then I’ll need to grow something in a container beneath it….something that will look nice against the red brick. White? Light pink? Purple? I’m not typically a huge fan of yellow or orange and usually gravitate toward the cooler colors. 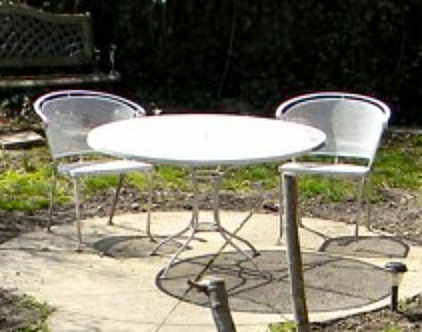 The table and chairs will need to be sanded, primed, and re-painted. In the meantime, they are perfectly functional – just a little bright in the sunlight. We’ll either paint them all black or a deep Hunter Green, I think. White is a bit much. 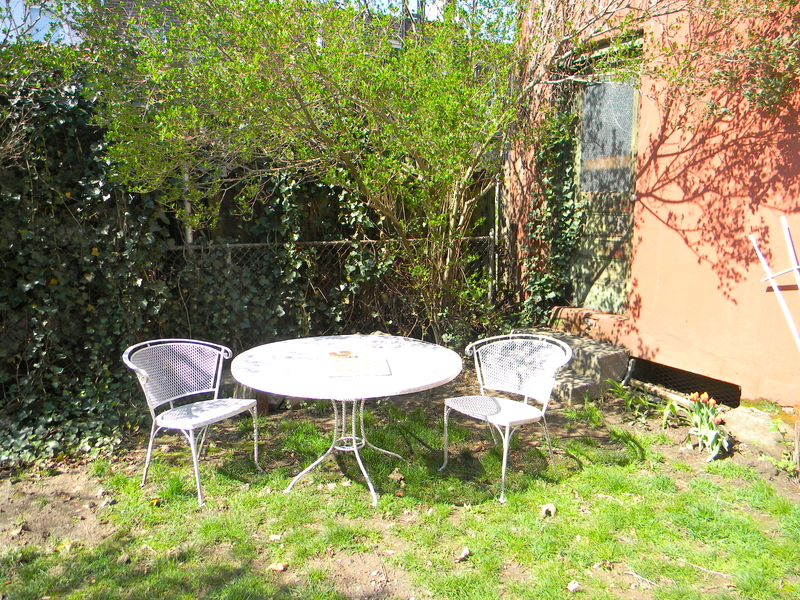 It is so great to be able to sit out side and have a place for your tea/dinner/wineglass/notebook/magazine, etc. We’ve already had a few meals outside and I can see this becoming a regular thing. The location of the table, however, has caused quite a buzz in the old beehive and we’ve spent a ridiculous amount of time discussing where to put it and playing around with different configurations. Once we brought it in, then the bench didn’t look right in its place anymore…the stone path didn’t look right, etc. Initially we thought the stone circle was the obvious place for the table and chairs, and they fit perfectly there…but neither of us liked it very much. When that fig tree grows back, it will drop figs all over that concrete area, and the birds who eat the figs will be dropping their own loads right there as well, as I remember from last summer. After spending entirely too many afternoons moving things around and casting our votes for this side or that, sun or shade, etc. Really – like there aren’t more important and meaningful things to be concerned about? Plus we can always move things back. Sometimes it’s just hard to agree! 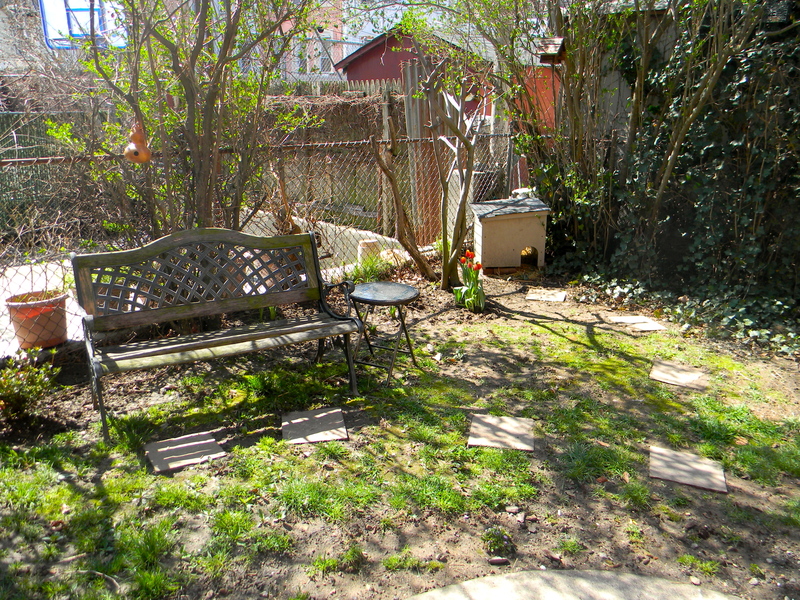 At long last, we have at last come up with a partially shady spot that we both like. The stone path we put in last fall also felt wrong once we brought the table and chairs in, and we played around with altering it, moving it, and removing it altogether. We ended up moving part of it and spacing out the blocks a bit more. Our next project is to put up some fern-leaf rolled fencing along that chain link fence, both for the privacy and to hopefully help with the barking puppy situation next door. He sure is cute, but wow is he loud, and seeing the feral cats in our yard doesn’t help him keep quiet! The plan is to eventually get a statue of St. Frances, which will speak to the husband’s Catholic nostalgia, and to my cat rescue work / the feral cats we take care of in the yard. St. Frances will go back near the cat shelter, hence the path leading back to it. Miraculously there have been no casualties, although I am a little nervous about it. I have three feeders, all of which are up high enough to be out of reach by any cats and provide plenty of branches for birds to hop or fly to. There are two in the yard and one along the side of the house by the driveway, where I can watch from the kitchen window. 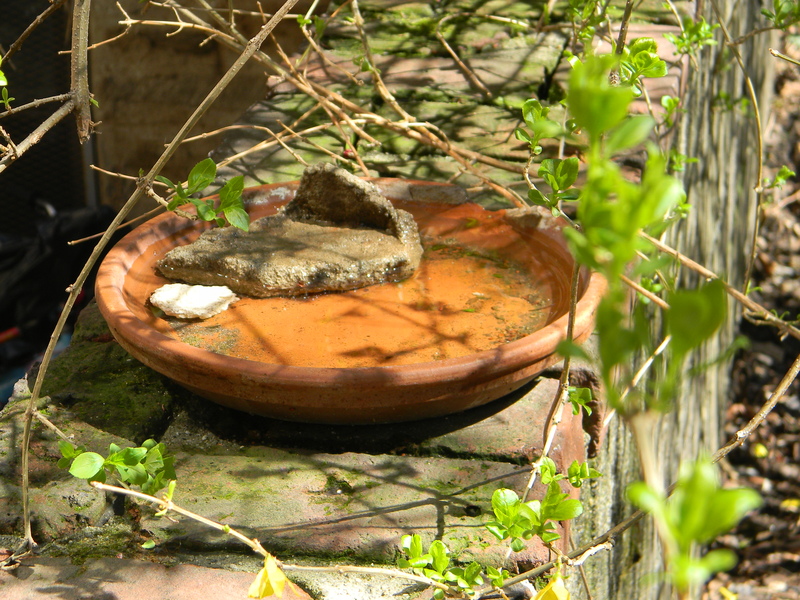 I recently added a bird bath along the driveway – basically just a large terra cotta pot saucer with a few stones and water along the brick wall by the feeder in the Forsythia. It’s taking a while for them to catch on, but I have seen a few birds stopping in for a sip. Oh, how I would love a large, cement bird bath but they are so damn expensive and heavy. The pot saucer route is quick and easy to clean and cheap to make. I just have to stay on top of keeping it filled with fresh water. 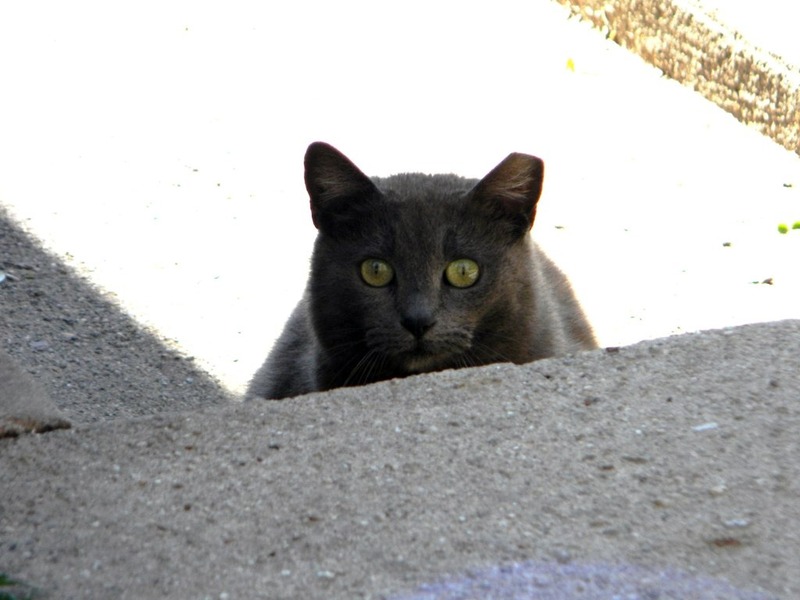 The last time I filled it I turned back to the house and saw Smoke, one of the ferals watching me closely from the steps down to the yard. She’s a sweet cat and sometimes lets me pet her. We really hope that the fence will help to block the puppy next door from seeing Smoke and the other cats. I sure wish there was a way we could still reach over and pet him, though. That will be the challenge for this weekend: fencing. Your Yard Can Be A CERTIFIED NATIONAL WILDLIFE HABITAT! 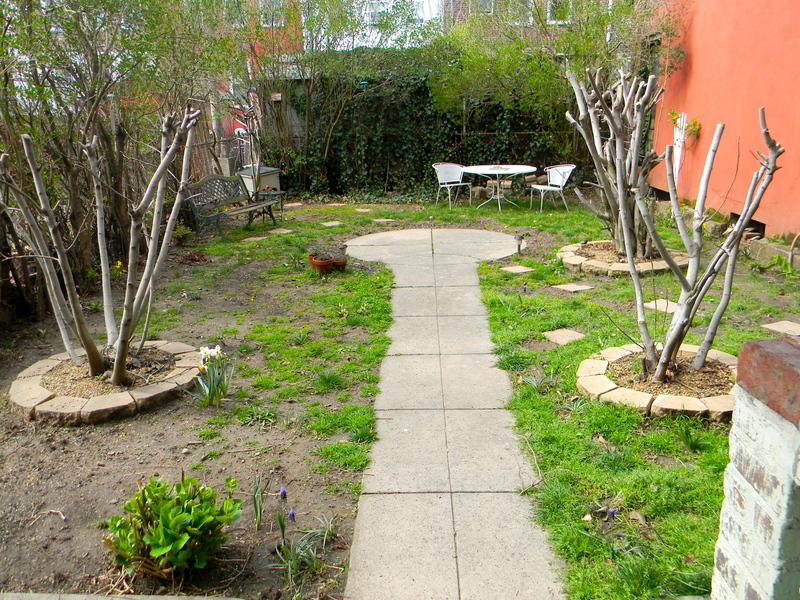 I read the coolest post over at one of my favorite garden blogs, Laguna Dirt. I am pretty sure that my yard would qualify! 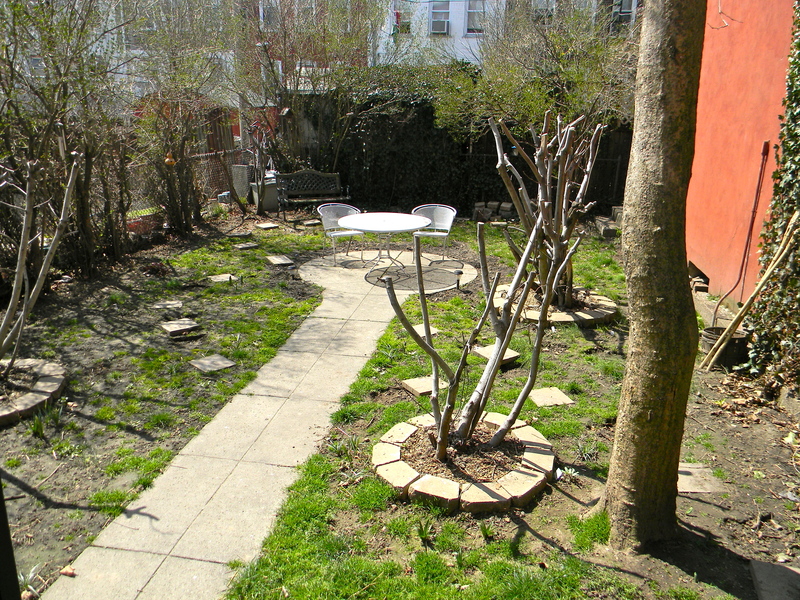 We have bird feeders, bird baths, and bird houses as well as plenty of trees and shrubs. Our yard is popular with a lot of birds (and several cats, and the occasional squirrel or raccoon). You can check out her great photos and read about the kinds of things she has going on in her yard that qualified it as an official wildlife habitat here. I think the sign is a great way to raise a little neighborhood awareness…maybe invite some questions or get other people interested. I think this would be a really great project for a school, or for elementary school kids to work on doing at home for part of a science class…extra credit…something. What a great way for city kids to become more aware of our natural surroundings and perhaps develop an interest in the environment and wildlife. Other styes of signs are also available. 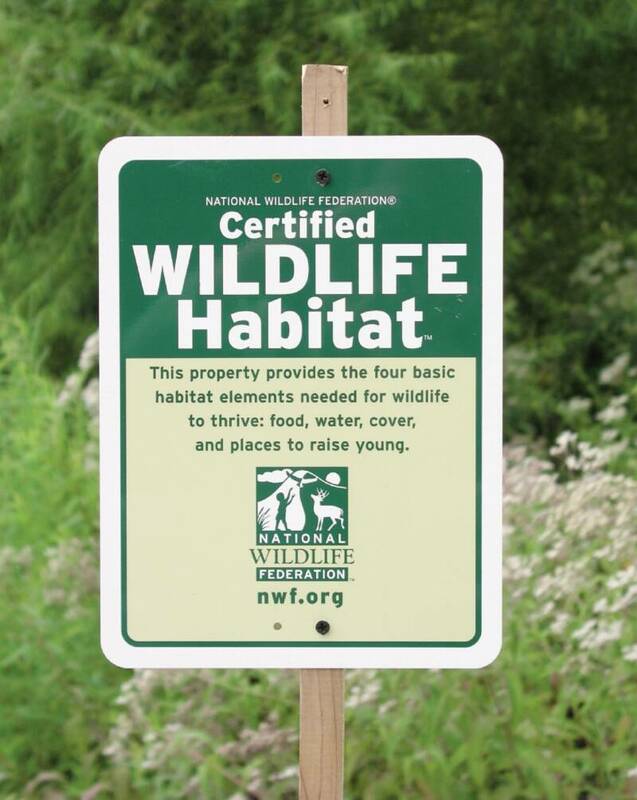 So I think a Certified National Wildlife Habitat sign might strike up some good conversations and maybe even inspire some neighborhood kids or families to take more of an interest in their own backyard. Maybe that’s being a little too optimistic for my block in Brooklyn, but you never know…maybe there are some future bird-watchers out there. I’ve already got a bit of a reputation as a “cat lady” because I trap-neuter-return (TNR) the local feral cats and provide them with some winter shelters and food. Why not go all the way and become and official habitat for wildlife? Thanks, Laguna Dirt, for the information and an awesome post!